The Vallumbrosan Order is a branch of the Benedictines that was founded in the eleventh century by Saint John Gualbert (died 1073). 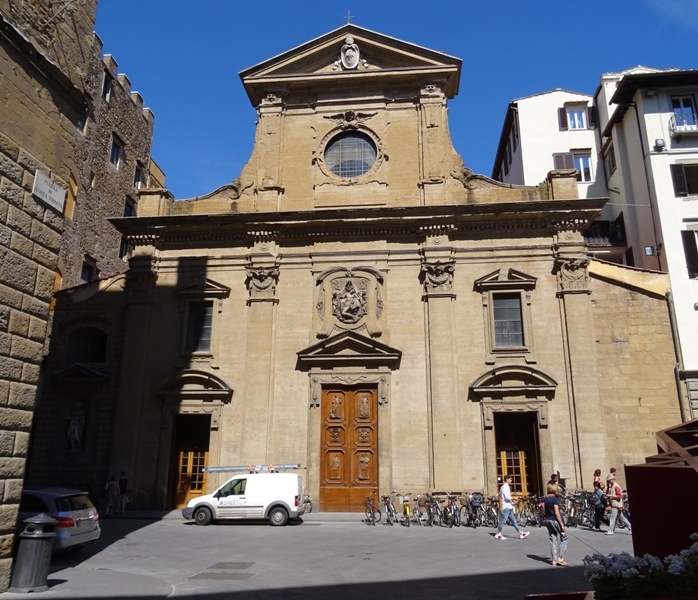 The first church of the Vallumbrosans in Florence was built in either 1077 or 1092 (different dates are mentioned in different sources). At that time it was outside the walls of the city. The church was given the name of Santa Maria dello Spasimo. In the following centuries, the church was rebuilt in the Gothic style and expanded. It was also renamed and became known to posterity as the Santa Trinita, the Holy Trinity. The main reason to visit the Santa Trinita is the presence of two very interesting chapels. They are deservedly famous and both the Sassetti Chapel and the Bartolini Salimbeni Chapel have their own page on Wikipedia, in multiple languages. Bernardo Buontalenti (ca. 1531-1608) was the man responsible for the church facade that we see today. The Santa Trinita is located in a piazza of the same name. The piazza is dominated by several stately mansions and a granite column topped by a statue of Lady Justice. The column used to be in the Baths of Caracalla in Rome, but was gifted to Cosimo de’ Medici by pope Pius IV in 1560. The piazza can also be seen inside the church: one of the frescoes in the Sassetti Chapel shows what the piazza and the church would have looked like in the fifteenth century. The frescoes will be discussed in greater detail below. 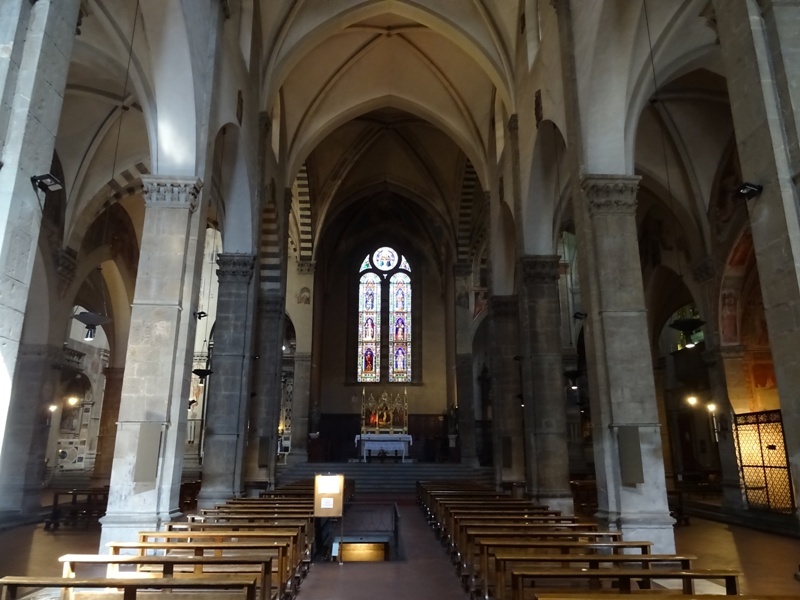 Many visitors have remarked that the Santa Trinita is a very dark church. When we visited the church in June 2016, we indeed needed some time to acclimatise and get used to the lack of light. When we sat down in one of the pews, a friendly old lady came up to us and asked us where we were from. She informed us – in very reasonable English – that she was part of the staff and that she could provide us with information and answer all the questions we wanted to ask about the church and its history. Of course the information would be free of charge. Well, that certainly was the warmest welcome we ever received anywhere in Florence. It is possible to visit the crypt of the Santa Trinita. Although some websites will inform you that it “is generally kept closed for safety reasons”, it was open when we visited the church and it was not necessary to make an appointment with the staff. It was, however, absolutely necessary to insert a two Euro coin into the machine to turn the lights on in the crypt. It is pitch dark down there and you will not be able to see a thing if you go down the stairs without paying. The crypt is quite small and mostly of interest because of the presence of several green marble columns from the old Santa Maria dello Spasimo. Fresco by Neri di Bicci. 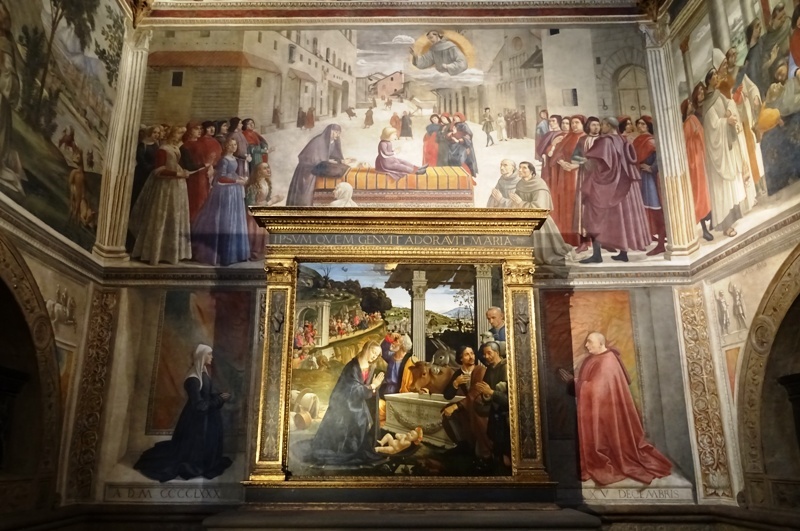 The altarpiece of the Santa Trinita is – how appropriate – a Holy Trinity. It is attributed to Mariotto di Nardo, a fifteenth century Florentine painter. The original altarpiece is probably much more famous. Cimabue’s Santa Trinita Maestà was painted before 1300 and was an innovative piece of art at the time. The Maestà was placed on the high altar and remained there until 1471, when it was moved to a chapel and replaced with a Trinity with Saints Benedict and Giovanni Gualberto by Alesso Baldovinetti (1425-1499). Both works of art are no longer in the Santa Trinita. Cimabue’s Maestà can now be found at the Uffizi, while Baldovinetti’s work has been moved to the Galleria dell’Accademia. In return, Mariotto di Nardo’s painting was taken from the Galleria’s repository and moved to the Santa Trinita. Apparently a similar text can be found in the Santa Prassede in Rome. There it can be seen in a nineteenth century mosaic of Saint Peter Igneus (died 1089), a disciple of John Gualbert. Peter Igneus was also a cardinal, and he may be the person with the red cardinal’s hat and the halo standing to the left of Saint John. The fresco was not originally part of the Santa Trinita. It was taken from the former monastery of the church of San Pancrazio (now the Marino Marini Museum). Back wall of the Cappella Sassetti. This chapel is definitely the highlight of the church. It was completely frescoed by Domenico Ghirlandaio, his brothers and his workshop between 1483 and 1486. Ghirlandaio (1449-1494) was one of the most prolific painters of his age, but he died young and his artistic heritage could have been even bigger. The frescoes in the chapel were commissioned by Francesco Sassetti (1421-1490), a rich manager of the Medici Bank who had acquired this chapel in 1478. On Christmas Day of the year 1480, Sassetti hired Ghirlandaio to fresco the walls of the chapel with scenes from the Life of Saint Franciscus of Assisi (1181-1226). Apparently the painter was quite busy, because work did not start until 1483. Ghirlandaio, Sassetti and members of his family as well as members of the Medici family and their entourage can all be seen in the frescoes. 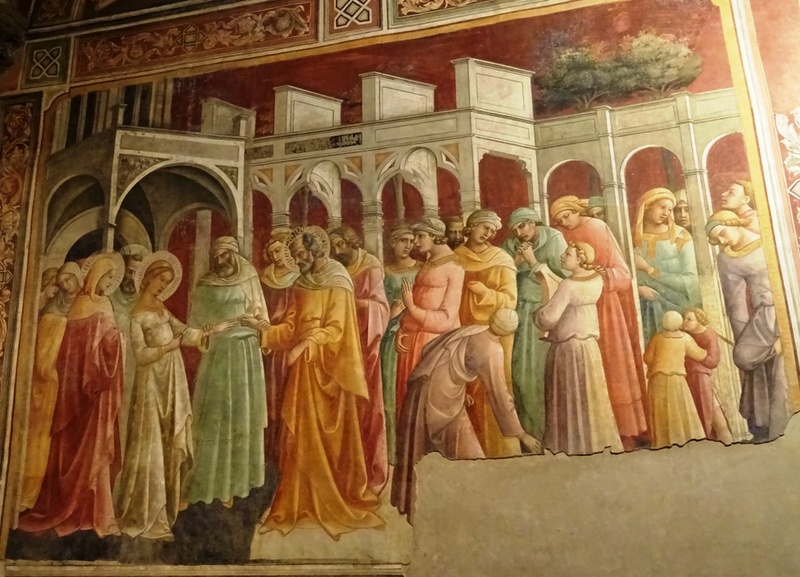 While painting the various scenes of the Life of Saint Franciscus, Ghirlandaio was obviously influenced by the late medieval painter and great innovator Giotto (ca. 1266-1337), who had painted a similar cycle in the Bardi Chapel of the Santa Croce, also in Florence. If we look at the stories depicted in the frescoes chronologically, we see the following episodes. First, in the lunette of the left wall, the young Franciscus renounces all his worldly goods. Then, on the lunette of the right wall, Franciscus, now in his late thirties, has travelled to Egypt during the Fifth Crusade and attempts to convince the Sultan Al-Kamil to convert to Christianity. The Sultan submits him to a test of fire. The meeting with the Sultan is presumably historical and must have taken place in 1219, but we do not know anything about the details of the meeting and the test of fire seems to be a later fabrication. The death of Franciscus of Assisi. Moving on to the lunette of the centre wall, we see the confirmation of the Rule of the Franciscan Order by pope Honorius III. This historical event took place in 1223. The fresco is very interesting because, although the actual event took place in Rome, it is clearly set in fifteenth century Florence. The Palazzo Vecchio and the Loggia dei Lanzi can be seen in the background and the four figures on the right are Sassetti’s brother-in-law, Lorenzo de’ Medici (nicknamed ‘Il Magnifico’), Sassetti himself and his son. Lorenzo’s sons can be seen ascending the stairs. Continuing to the lower part of the chapel, we see Saint Franciscus receiving the stigmata on the left wall. Tradition dictates that this occurred in La Verna in 1224. The city on the right side of the fresco has a cathedral and campanile which are clearly meant to represent the Duomo and Leaning Tower of Pisa. This is a somewhat peculiar element, as Pisa is some 120 kilometres west of La Verna. The fresco on the right wall shows the death of Franciscus in 1226. 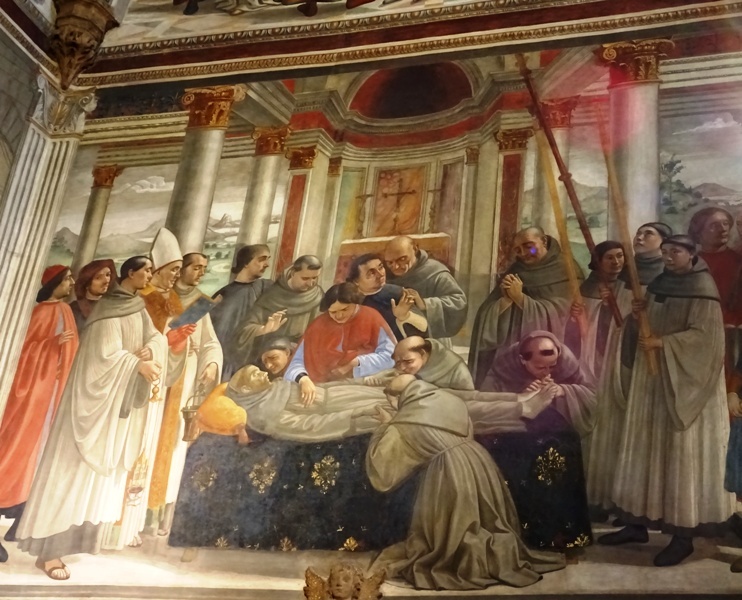 Finally, on the back wall of the chapel, we see Saint Franciscus posthumously performing a miracle. He has resurrected a small boy who has fallen off the Palazzo Spini Feroni, which today can still be found opposite the Santa Trinita. The Palazzo and the boy falling to his death can be seen in the background. The fresco shows what the Piazza di Santa Trinita would have looked like in the fifteenth century and we can also see the church of Santa Trinita on the right, with its original facade with Romanesque (arches) and Gothic (rose window) elements. Ghirlandaio painted himself and – presumably – Sassetti’s daughters in this fresco. Franciscus of Assisi performs a miracle. 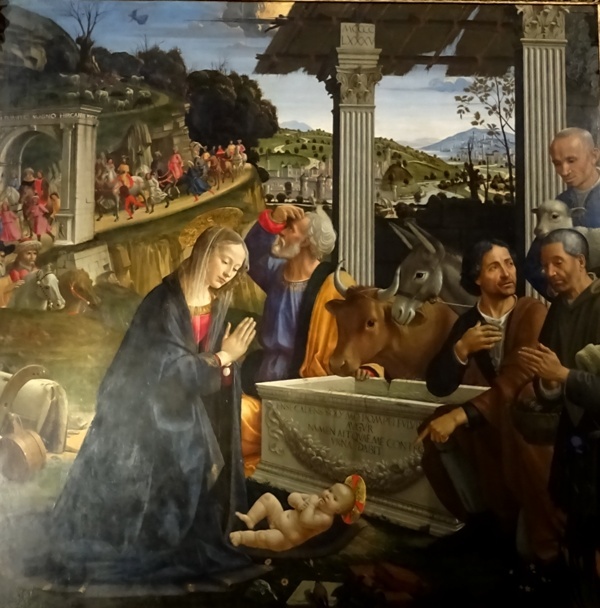 The chapel is completed by an altarpiece showing the Adoration of the Shepherds, also by Ghirlandaio, who is himself one of the shepherds (the one on the left, pointing at the child). The Roman numerals on the left column in the scene indicate that the altarpiece was painted in 1485 (MCCCCLXXXV). To the left and right of the altarpiece we see the kneeling figures of Nera Corsi, Sassetti’s wife, and Sassetti himself (see the image above). They were buried in the chapel in tombs designed by Giuliano da Sangallo (ca. 1445-1516). Good pictures of the frescoes can be found in the Wikipedia article about the chapel. My own pictures included in this post are of mediocre quality. The light in the chapel is certainly not perfect, and you have to pay to switch it on for a couple of minutes. By comparison, the Bartolini Salimbeni Chapel is less spectacular than the Sassetti Chapel, but it is interesting nonetheless and turning on the light will cost you nothing (if I remember correctly). The chapel itself has been the property of the Bartolini Salimbeni family since the second half of the fourteenth century. 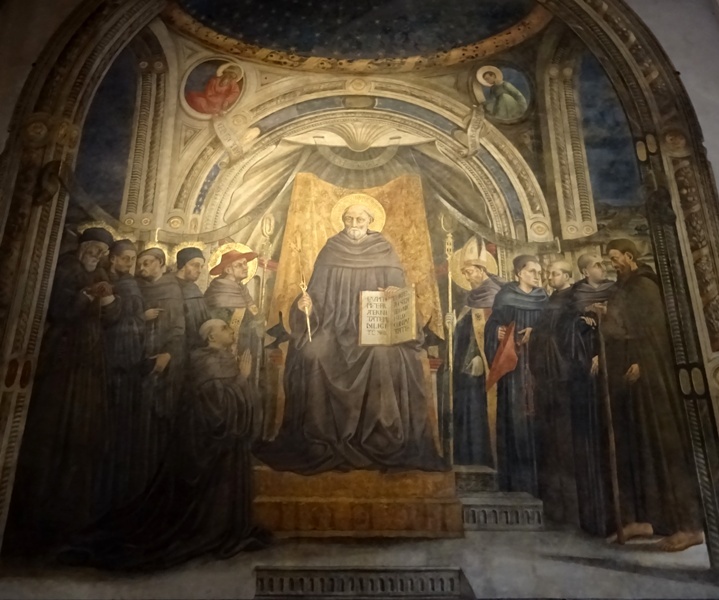 Both the frescoes and the altarpiece of this chapel are the work of Lorenzo Monaco, “Lawrence the Monk”, a painter who was born in Siena around the year 1370 and died in Florence in 1425. Lorenzo Monaco worked on the chapel between 1420 and 1425, so the frescoes and altarpiece here may be his last works. The altarpiece – an Annunciation – has its own Wikipedia page, like the chapel. The Marriage of Mary by Lorenzo Monaco. The frescoes in the chapel are about the Life of Mary. They are based on the Gospel of James, one of the apocryphal gospels, probably written around the year 145. The frescoes feature Joachim and Anna, Mary’s parents, who are not mentioned in the canonical gospels. Although the frescoes have for the most part been preserved, they are nevertheless damaged in parts, especially the ones on the back wall behind the altarpiece. The colours look pretty good today, no doubt the result of several restorations. The best fresco in the chapel is, in my honest opinion, the one on the right wall, depicting the Marriage of Mary. According to the Gospel of James, Mary was just twelve years old when she married Joseph. The whole scene is set in the Temple in Jerusalem, and it is the high priest who joins the two in holy matrimony. The colours of the fresco are a bit eccentric. Only Mary wears a white dress, while the clothes of all the others in the scene are orange, turquoise, pink or even purple. The date is mentioned on the fresco of the back wall.